In a city hailed as the Live Entertainment Capital of the World, a new neighborhood is the talk of the town. Branson Hills is your opportunity to experience the excitement, the opportunity, and the lifestyle that is... Branson, Missouri. Nestled in the breath-taking Ozark Mountains, there are few places in America that offer the diversity of natural beauty, recreational activities, and economic possibilities as Branson, Missouri. With 45 state-of-the-art, multi-million dollar theaters, that are home to more than 100-live shows each day, guests of all ages enjoy diversity unrivaled by any other vacation destination. Branson truly is America's favorite family playground. The same excitement which draws more than 7 million vacationers every year also provides an amazing backdrop for the thousands of residents that have smartly chosen Branson as their home. For more Branson Area information, Click Here. 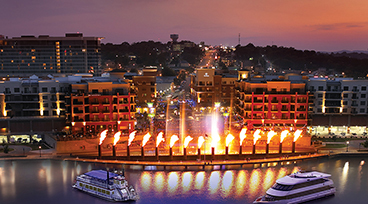 Branson Hills is brought to you by HCW, LLC, the same team of entrepreneurs that envisioned and built Branson Landing. Locally based in Branson, HCW has gained an impressive reputation regionally and nationally, and is fast approaching one billion dollars in Branson real estate developments. This powerful team with global credentials has an innate ability to foresee a need in the community, and step up to meet the challenge. Click here to learn more about HCW, LLC developments in Missouri and other states. No matter what stage of life you're in, you'll find the right place to call "home" at Branson Hills. 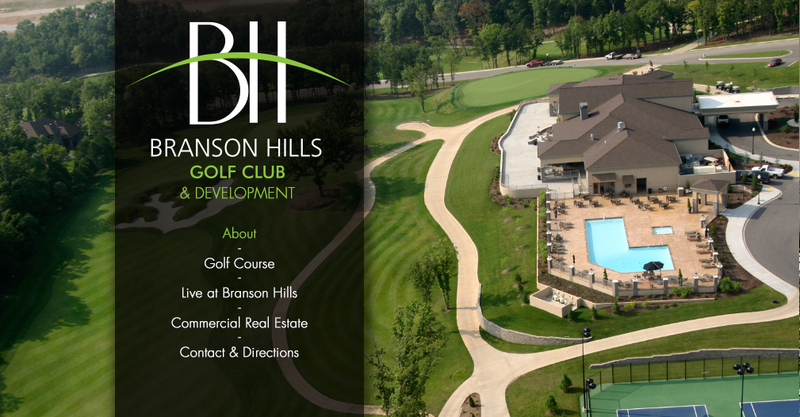 Providing more than 1,150 new residences, Branson Hills is Branson's largest neighborhood. 527 single-family home sites offer spectacular landscapes - from sweeping golf front views to secluded hideaways in a wooded setting. The condominiums are the perfect place for a second home or a vacation home, and even qualify for a nightly rental program. For those looking for minimal upkeep, but outstanding lifestyle, there are 18 charming golf villas are sure to be the choice residence for those who find the lure of fresh greens irresistible. Click here to learn more about Living in Branson Hills to include our NEW Custom Homes. Adjacent to Branson Hills is the Branson RecPlex a state-of-the-art sports complex that combines recreation, fitness and sports at one convenient location. The 44,000 square foot recreation center features two gymnasiums for basketball and volleyball, a fitness center, a 3-lane indoor track, locker rooms, community rooms and concession area. Due to Branson's reputation as a family vacation destination, the facility has become a hot bed for tournaments, hosting over 40 state, regional and national tournaments annually. Outdoor facilities include a 12,250 sq. ft. aquatic center, soccer fields, baseball/softball complex, picnic pavilions, a large children's playground and walking paths over the 40 acres. If shopping is your idea of recreation, Branson Hills is within a half mile retail giants: Target, Home Depot, Kohl's and TJ Maxx, Wal-Mart Supercenter, Books-A-Million, Pier One Imports, PetCo, and MC Sports. A mile and a half of uncharted, waterfront shopping, dining, and entertainment is just 5 minutes from Branson Hills - the Branson Landing - Where Shopping, Dining & Entertainment Takes Center Stage!